Below is a diagram of a regular triangular prism. Triangles ABC and DEF are equilateral and parallel to each other. 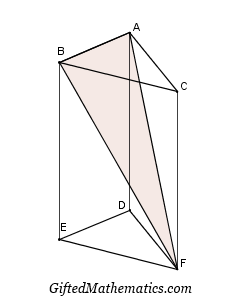 A cut is made that slices the prism into two pieces in such a way that the plane passes through points A, B and F.
What is the ratio of (volume ABEFD) : (volume ABCF) ?